UI Geek's Blog: Microsoft MVPs: Sharing is what they do! Microsoft MVPs: Sharing is what they do! 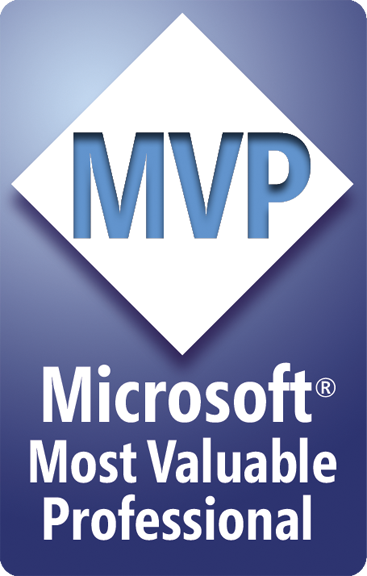 Just this year, I was awarded the Microsoft MVP (Most Valuable Professional) Award by Microsoft. I was thrilled and once I got over the fact that the notice came on the morning on April 1st and was NOT, in fact, an April Fools joke I was even happier. Microsoft's recognition has allowed me to better share what I know and be helpful to people I come into contact with every day in the course of my business and hobby life. There are MVPs all over the world. There are MVPs close to you. Those MVPs want to, love to, help you do what you love to do. The one single most important distinguishing characteristic of MVPs and what they are most recognized for is that they LOVE to help others. If you need help, ask an MVP, simply by having that title you know they WANT to help. If you don't know any yet, you can find one close by if you need a little help. Just click the "Find an MVP" on the http://mvp.microsoft.com website. In June Microsoft put together a training day for MVPs in Canada and there were more than 100 of us that attended. As a relative newbie I really had no idea what to expect. I didn't even know, at the time, what breadth of skills are involved in the Microsoft MVP program. There are over 70 different categories of expertise, everything from Windows Phone to Security to Xbox to Microsoft Office and more. And let me tell you, there are folks that have been MVPs for years and years that are experts in their fields. Not just some people who passed some tests but ones who have proven themselves for years in the field, on customer sites, with user groups and on-line but always, always always helping developers, end-users, basically anybody who asks. I found the most useful thing about the one day event was that even these "rock stars" of the technical world will help l’il ol’ me. Sadly I forgot to get my propeller hat autographed, but there will be other opportunities. These people are not going anywhere. I had a chance to meet with many MVPs from many different areas of expertise. Some of the long time MVPs put on presentations to the rest of the MVPs (If you ever have the chance to go to an MVP presentation, make the time and go) and they blew me away. One of the things these people do is share their knowledge in many different ways and presentations are one of them and they are big on volunteerism. They share with other MVPs, share with people who use Microsoft Technologies and share with people who don't use MS technologies. I thought I'd write this entry to help me remember all the things I learned about MVPs. Have lots of different skill sets with lots of different points of view. LOVE to help people use Microsoft Technologies. are very strongly supported by Microsoft and Microsoft works hard to enable them to share that support with everybody they know. One of the things that happened at the meeting was much sharing of stories. Some of the MVPs have been members for years and have some great stories to tell. They really have helped a lot of people and companies over the years. There was one Windows Phone MVP (@atleyhunter) who helps anybody who asks about development of Windows Phone apps. Because of an MVP, many developers have had the chance to publish apps to the Windows Phone Store that might not have been able to get over the hump without him. Then there was the security MVP who helped countless companies protect assets and privacy and there were many more inspiring stories. One of the themes is that all these folk are really good at what they do but they are also really friendly with each other. Microsoft provides them with many channels of communication and they are not shy about using them. When you ask an MVP for help you are getting that MVP, all his friends (hundreds at least) AND Microsoft themselves. You can find MVPs on the MVP site, http://mvp.microsoft.com, or at User Group meetings in your area or at most training event days around your area. I know at the last Azure day in the Vancouver area there were at least 4 MVPs in the room offering assistance. My name is Mark Schramm (@markbschramm), and I'm proud to say I'm a Microsoft MVP, Client Development and if you need help with App Client Development contact me and I'd be happy to lend a hand or find somebody who is expert in the field you need!